We assembled a dataset of 192 carefully selected species — 51 extinct and 141 extant — and 976 apomorphies distributed among 610 phenotypic characters to investigate the phylogeny of Squamata (“lizards,” including snakes and amphisbaenians). These data enabled us to infer a tree much like those derived from previous morphological analyses, but with better support for some key clades. There are also several novel elements, some of which pose striking departures from traditional ideas about lizard evolution (e.g., that mosasaurs and polyglyphanodontians are on the scleroglossan stem, rather than parts of the crown, and related to varanoids and teiids, respectively). Long-bodied, limb-reduced, “snake-like” fossorial lizards — most notably dibamids, amphisbaenians and snakes — have been and continue to be the chief source of character conflict in squamate morphological phylogenetics. Carnivorous lizards (especially snakes, mosasaurs and varanoids) have proven a close second. Genetic data, presumably less burdened by the potential for adaptive convergence related to fossoriality, were expected to resolve these conflicts. Although recent gene phylogenies seem to do so, they also differ radically from any phylogeny based on the phenotype, especially for the most ancient crown squamate divergences that occurred during the latter half of the Mesozoic. Our study relied on traditionally prepared specimens as well as high-resolution computed tomography scans that afforded unprecedented access to the cranial anatomy of Squamata. This, along with the inclusion of stem fossils, provided an unparalleled sample of the phenotype enabling us to more fully explore the extreme incongruences between molecular and morphological topologies for the squamate tree of life. Despite this extensive new database, we were unable to find morphological support for the major rearrangement of the deep divergences in Squamata proposed by recent molecular studies. Instead, our data strongly support the same fundamental topology suggested by most previous morphological studies — an Iguania-Scleroglossa basal split, a sister-group relationship between Gekkota and Autarchoglossa, and the divergence between Anguimorpha and Scincomorpha — and documents the extreme degree of morphological homoplasy required by those molecular topologies. This specimen was collected from Ukhaa Tolgod, Upper Cretaceous Djadokhta Formation, Mongolian Gobi Desert. 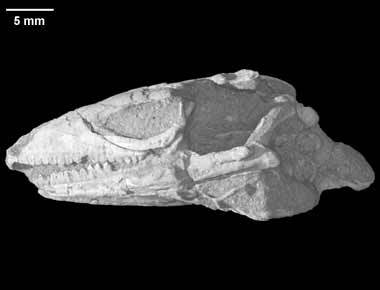 It was made available to The University of Texas High-Resolution X-ray CT Facility for scanning by Dr. Jessie Maisano of The University of Texas at Austin and Dr. Mark Norell of the American Museum of Natural History. Funding for scanning and image processing was provided by a National Science Foundation Assembling the Tree of Life grant (EF-0334961), The Deep Scaly Project: Resolving Squamate Phylogeny using Genomic and Morphological Approaches, to Drs. Jacques Gauthier of Yale University, Maureen Kearney of the Field Museum, Jessie Maisano of The University of Texas at Austin, Tod Reeder of San Diego State University, Olivier Rieppel of the Field Museum, Jack Sites of Brigham Young University, and John Wiens of SUNY Stonybrook. The specimen was scanned by Matthew Colbert on 17 February 2005 along the coronal axis for a total of 810 slices. Each 1024x1024 pixel slice is 0.0472 mm thick, with an interslice spacing of 0.0472 mm and a field of reconstruction of 22 mm. Gao, K., and M. A. Norell. 2000. Taxonomic composition and systematics of late Cretaceous lizard assemblages from Ukhaa Tolgod and adjacent localities, Mongolian Gobi Desert. American Museum of Natural History Bulletin 249:1-118. Three-dimensional volumetric renderings of the isolated right mandible. All are 1mb or less. To cite this page: The Deep Scaly Project, 2009, "Parmeosaurus scutatus" (On-line), Digital Morphology. Accessed April 25, 2019 at http://digimorph.org/specimens/Parmeosaurus_scutatus/.